We're quickly heading into the second weekend for Rogue One: A Star Wars Story, and fans' hunger is still at a high. One of the best things about this new Star Wars spin-off is the return of Darth Vader. We actually get to see the iconic villain in a more vulnerable place in this adventure. Namely his home. Walking out of the experience, many have wondered what planet Darth Vader has built his castle on, and just what we're seeing here. Some of those Star Wars questions have been answered, and the secrets have been revealed. Thanks to /film, a deep dive into the literature release amidst the Rogue One hype has helped give a better understanding of what happened to Darth following the events of Sith. And how he came to wind back up on the volcanic planet of Mustafar. Darth Vader is still missing his limbs, and appears to be in incredible pain when not in his shiny black armor. So why did he return to the place that caused him the most emotional turmoil of his entire existence? Darth Vader's castle is a location that is steeped in ancient Star Wars lore that dates all the way back to the original movies, namely The Empire Strikes Back, which was supposed to have visited this location first. There has actually been quite a bit about Darth Vader's home revealed in the current cinematic canon that was firmly established once Disney took control of LucasFilm. And it has been confirmed since the movie's debut this past Friday that the planet is definitely one we've seen before. Mustafar is known to fans as the planet at the end of Revenge of the Sith where Obi-Wan and Anakin have their climactic final duel, the place where Old Ben decimates Skywalker, leaving him to die. It is essentially the birth place of Darth Vader. Why Darth Vader returns to such a tragic scene is partially explained by originally Rogue One writer Gary Whitta in the Art of Book that was released last week in conjunction with the movie. He says this. "The fact that he has chosen to build his mausoleum here is a nod to the conflict in him, that he would go back to this place to reflect on what happened to the man he once was. At the same time, it's also terrifying, and when he emerges with all of his armor, he's Darth Vader." The official cinematic canon tie-in book Star Wars: Aftermath, which was released around the time of The Force Awakens, also holds some key answers. Iconic rebel pilot Wedge Antilles explains that Mustafar holds some kind of importance for the Imperial Leadership. It is said to be a location where Darth Vader took kidnapped Jedi to torture them before their execution. The Empire built Darth Vader's castle on Mustafar so he would have a home while exacting these heinous deeds in the name of the Sith. In Star Wars lore, that is considered 'myth'. But in the currently airing Star Wars Rebels, which returns for the second half of Season 3 in early 2017, it is discovered that the Galactic Empire took over Mustafar following the end of the Clone Wars, and have maintained secret facilities on the planet. In the episode titled 'Fire Across the Galaxy', Grand Moff Tarkin makes his return to capture Kanan, thus taking him to Mustafar to torture him, and extract information about the Rebel alliance. Hera is asked about the planet, and she says this. The book goes to explain that, while we never see it on screen in Rogue One, the Dark Monolith is build above a natural Sith Cave that holds its own dangerous secrets. It's highly likely that this castle will play a key role in Star Wars 8, and is the connective tissue that is laid between that upcoming sequel and this first big screen spin-off. Some speculate that Snoke has actually made the castle his home in the wake of Vader's untimely demise in Jedi. And it's likely that Kylo Ren, grandson of Anakin Skywalker, will return here in Episode VIII. The Art of Rogue One book teases the castle's return in future movies. 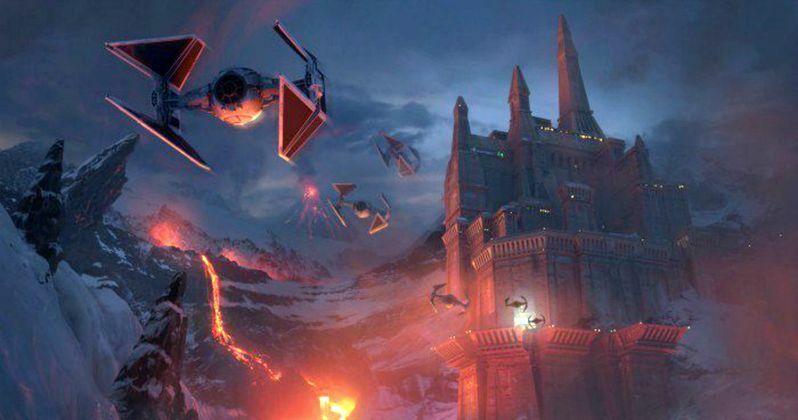 "Vader's Mustafar castle in Rogue One would be concept, designed, and explored beyond even the narrative needs of Rogue One itself. "We were building worlds, so we always had to keep in mind the broad strokes and the big picture, in case they were needed for the story," said [Doug] Chiang." The castle seen on screen in Rogue One was based on original concept art created by the legendary Ralph McQuarrie who worked on the original trilogy. The scene inside the castle also brings back the Bacta tank first seen in Empire Strikes Back. Concept artist Christian Alzmann had this to say about its inclusion. "This is where Vader stays, because it's the only place he feels comfortable. The idea is that he would have a massive cylindrical machine in the center of his room, and in the center of that machine is a one-person bacta tank that looks out through a window onto the lava fields of Mustafar. It's both a meditation and a healing chamber. There's a lava river underneath, bottom-lighting the room eerily. These arms would come down to pull apart the chamber the way you might separate a pill capsule, and the bacta would leak out on the hot grills to create steam - partially because steam is so atmospheric and awesome, and partially because you don't really want to see a naked Vader. But there would be hints and glimpses of his twisted body breaking through the steam. And then, at the end, you might barely read a silhouette of the helmet as it comes down." The Bacta tank is used onscreen to help show just how broken a man Darth Vader truly is. And it was Lucasfilm head boss Kathleen Kennedy who really responded to this idea when she saw some of the concept art. There is one final question, though, that has left some fans scratching their heads. Rogue One took some chances, introducing new ideas that aren't familiar to the original films. One thing it does differently is include title cards for each planet that the heroes and villains visit, such as Jedha and Scarif. Mustafar is one of the few locations that does not get one of these title cards. Why? Lucasfilm Story Group's Pablo Hidalgo claims that it was the director's choice to keep a mystery surrounding the location and its inhabitant. Most likely, it was a way to keep the big Darth Vader reveal from happening a little too soon. You can see some of the concept art here.